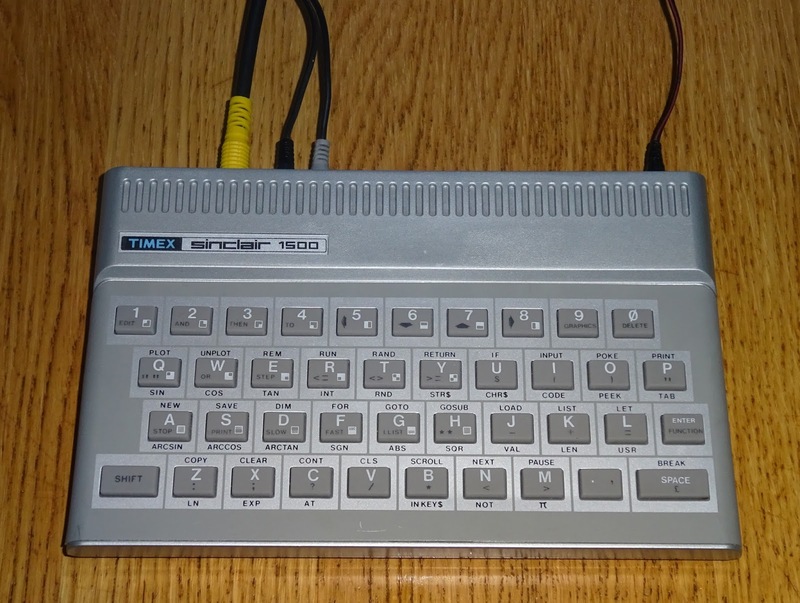 This is a Timex Sinclair TS1500, a follow up to the TS1000. 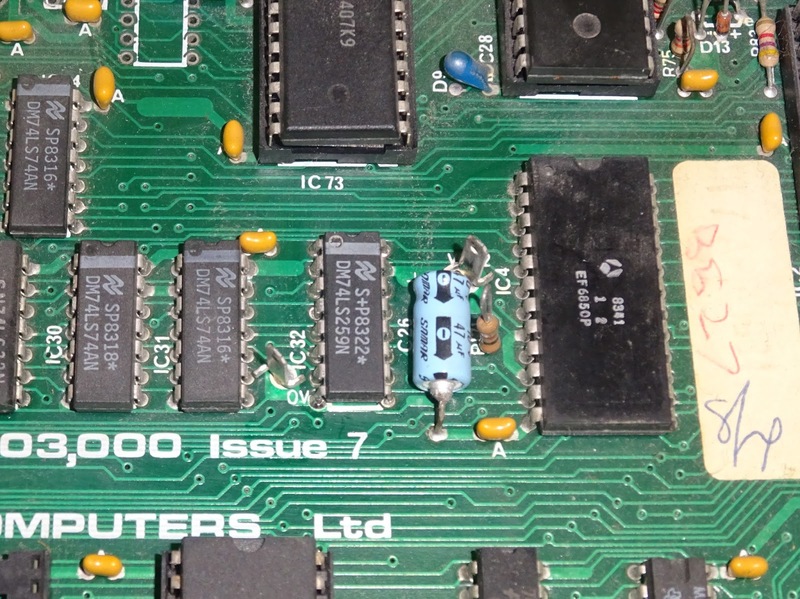 That was just a rebadged ZX81, the same issue 3 ZX81 board in a ZX81 case (with a bit of extra RF shielding). This is much more than that. It was only released in the United States, so is a but of an unusual sign here in the UK. 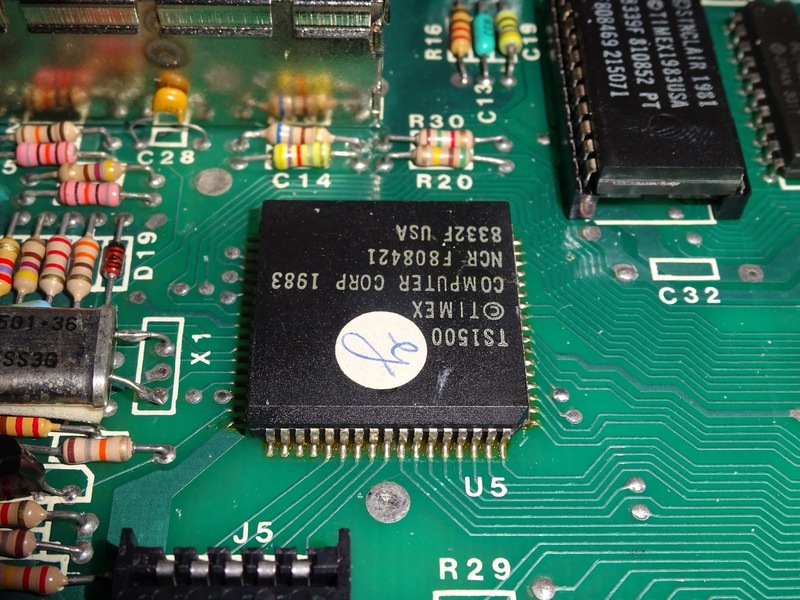 They have started with the BASIC ZX81 circuitry, Z80 CPU, 8K BASIC ROM, but have updated the ULA with a proper crystal osciallator, and built in wait state control (which seems to be an afterthought on the ZX81). 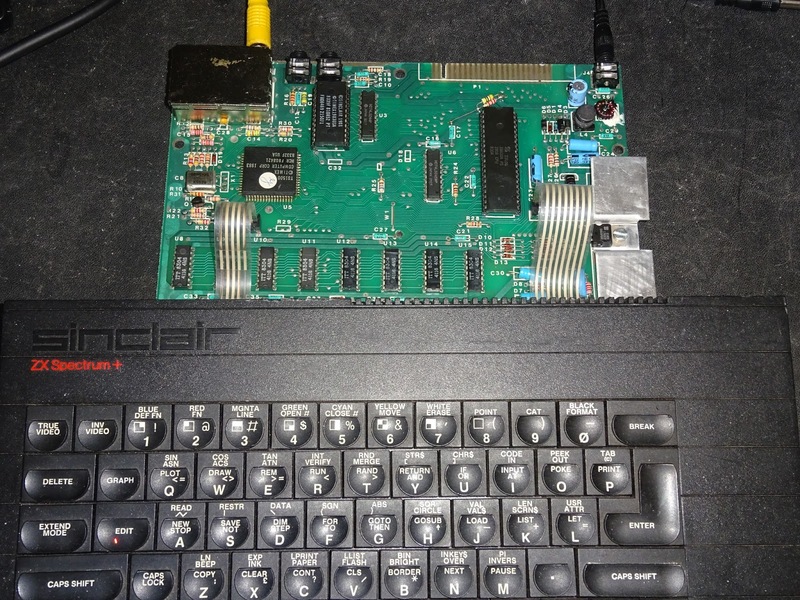 They have taken the Spectrum case and keyboard, and also 8x4116 DRAM giving 16 K of RAM. 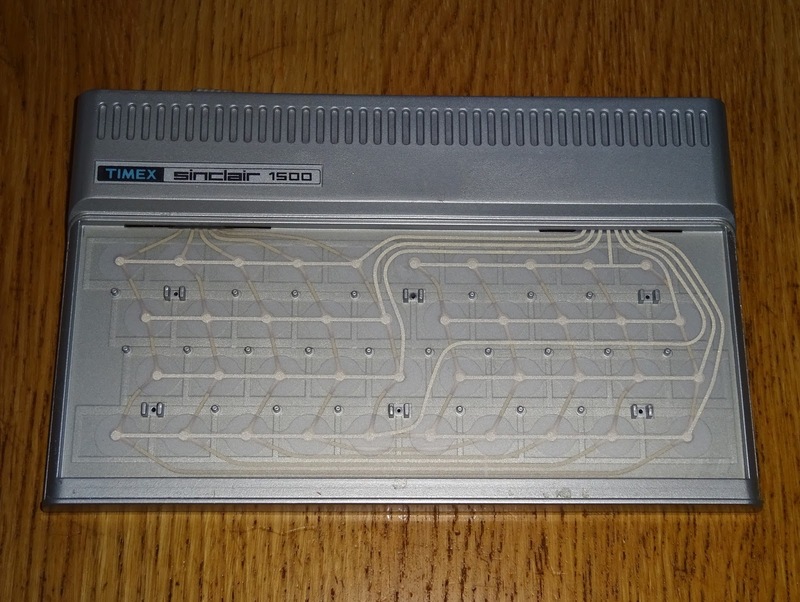 The date code shows late 1983, the Sinclair ZX Spectrum was onto issue 3 boards by that point, seems odd that Timex were redesigning and pushing the ZX81 at this stage. To power the DRAM, they have used something very similar to the Spectrum's non-too-reliable DC-DC converter. 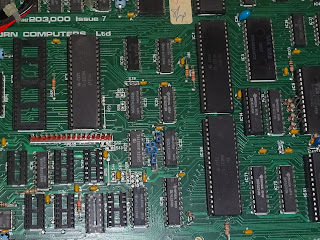 The chip count is about the same as the unexpanded issues 1 ZX Spectrum, with which this has a lot in common. 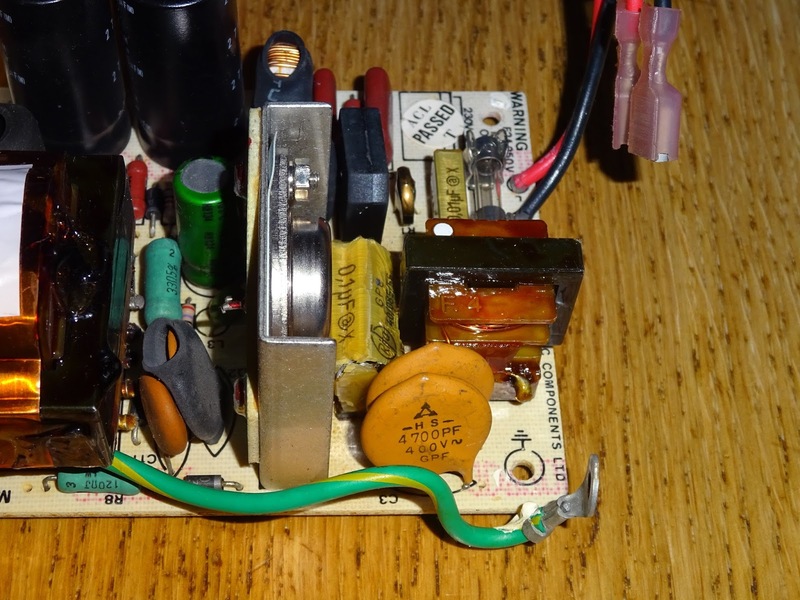 The 5V power is still provided by a 7805 regulator, mounted on the right hand side of the case. If this was going to get heavy use, I would substitute a switching regulator, but this particular unit is fine to stick with the 7805 and heatsink. 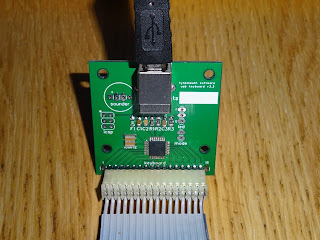 Although that power connector / edge connector arrangement looks very Spectrum like, they have stuck with the ZX81 style 3.5mm mono jack for the power connector, rather than the Spectrum's 2.1mm DC jack. 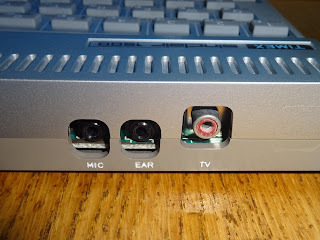 The Mic, Ear and TV options have been moved to the back like a Spectrum. This one has been sent to me by a friend in the states. 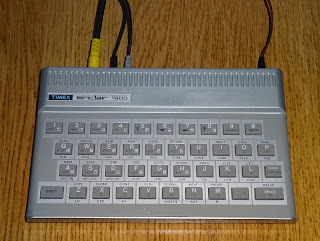 It appears to power up, but there is no response from the keyboard. 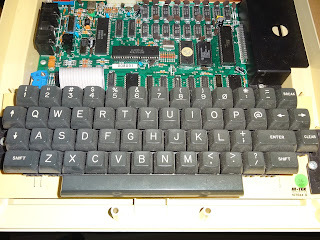 Taking it apart shows it has the same fault as many ZX Spectrums do, one of the membrane tails has cracked. Before I can tackle that, I need to check the TV output. 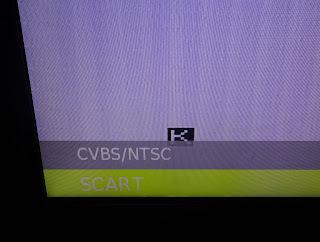 This is NSTC RF, and I do not have a suitable tuner here. 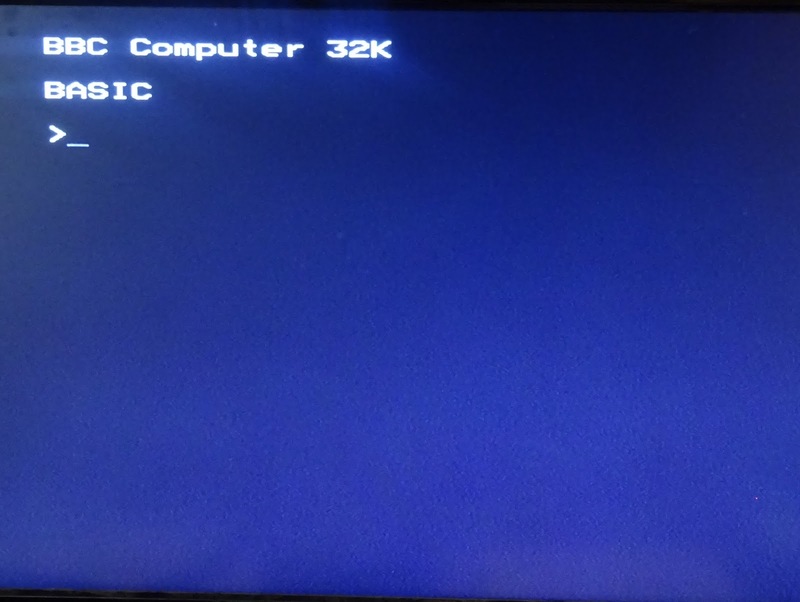 It needs a composite video conversion anyway, so that's the first task. 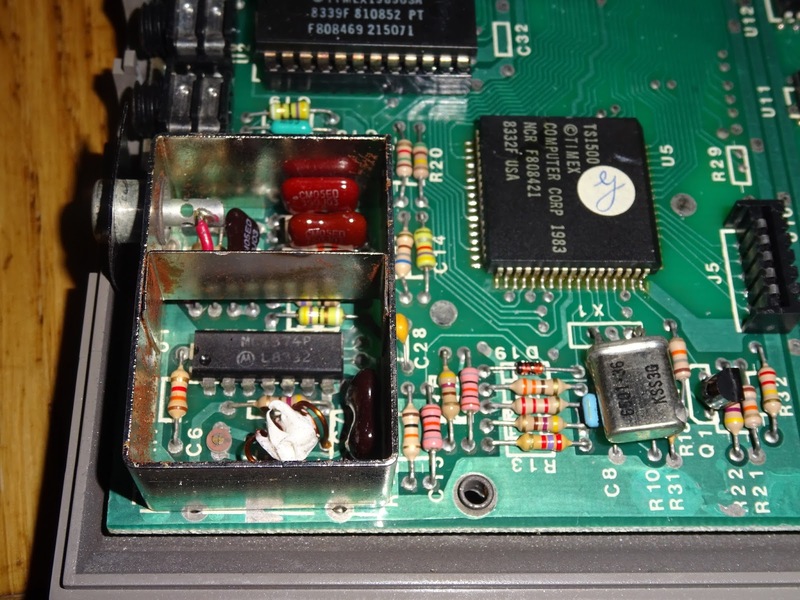 What appears to be a modulator box is actually just a screening can around an area of the PCB. Within is an MC1374 based TV modulator circuit. There is also a bit of rust in there, seems to be contained within, presumably from moisture within the can. 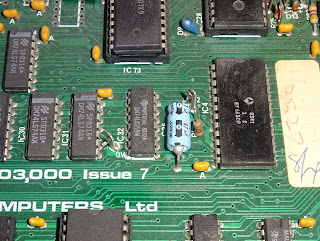 This makes the conversion a bit more complicated that usual. 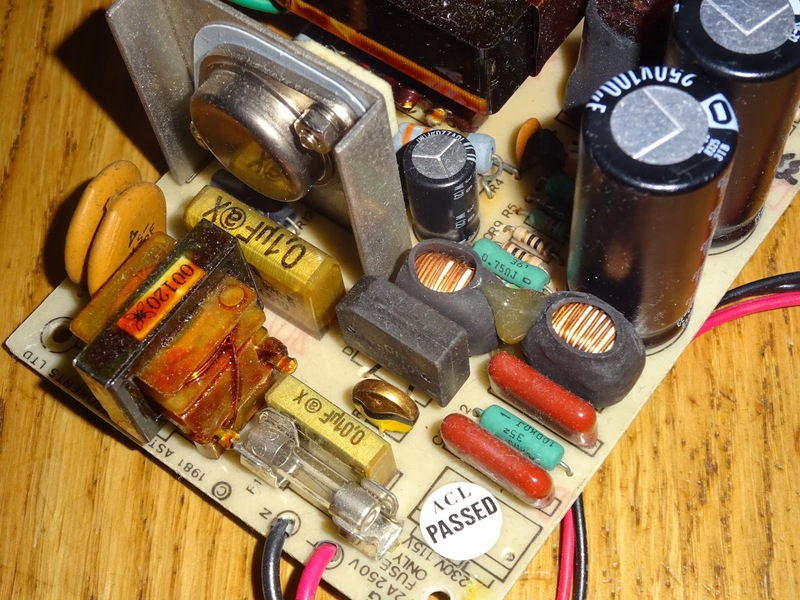 The typical approach on a later ZX81 is to disconnect power, input and output from the modulator and install a small buffer amplifier board. I thought about it for a while and decided the best option was to remove the MC1374. That would disable the rest of the circuitry in there, as well as providing convenient points to pick up the 5V supply and video inputs. 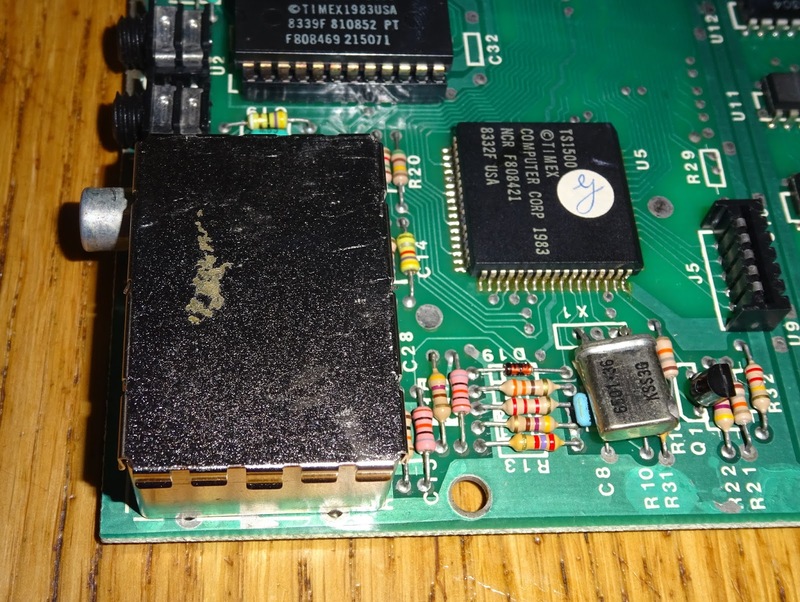 It also leaves the option to revert to RF at a later date, should anyone want to. 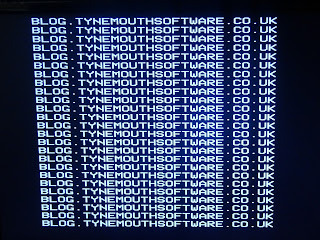 I used one of the video buffer boards from The Future Was 8 Bit (these are currently on offer until the end of the month). 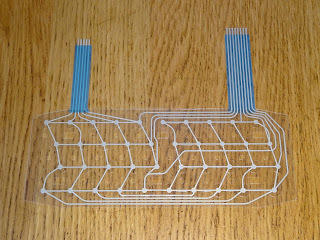 I started with the bare board version and added wires for the required connections. 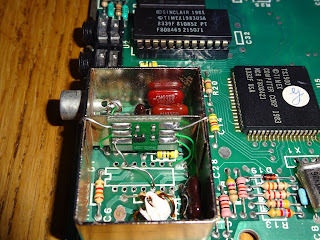 The power, input and output with thin wire and some solid tinned copper wire for the three ground pads. 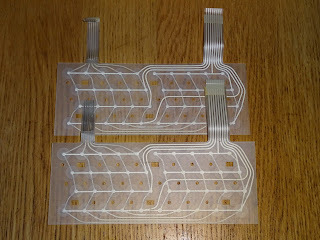 The remaining two pads were for audio passthrough, which aren't needed here. 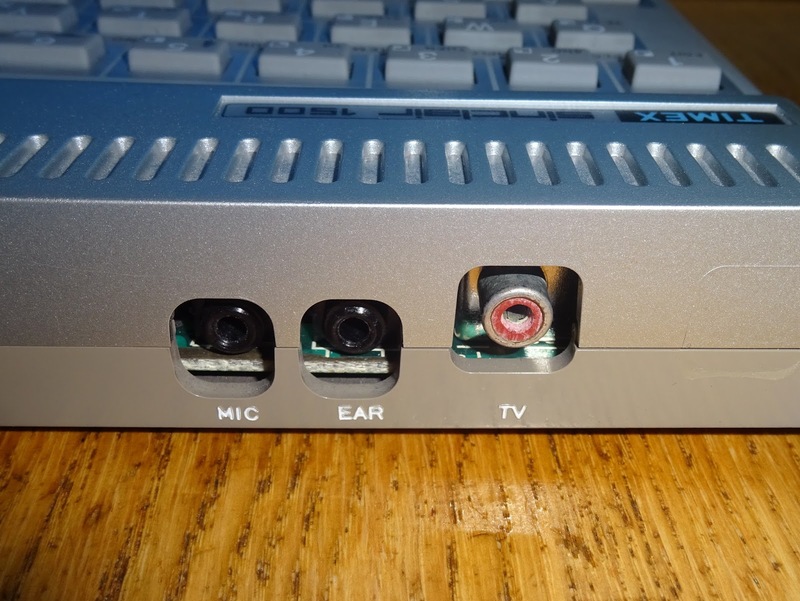 The TS1500 doesn't have audio, although it does have the Spectrum's speaker cutout in the base! 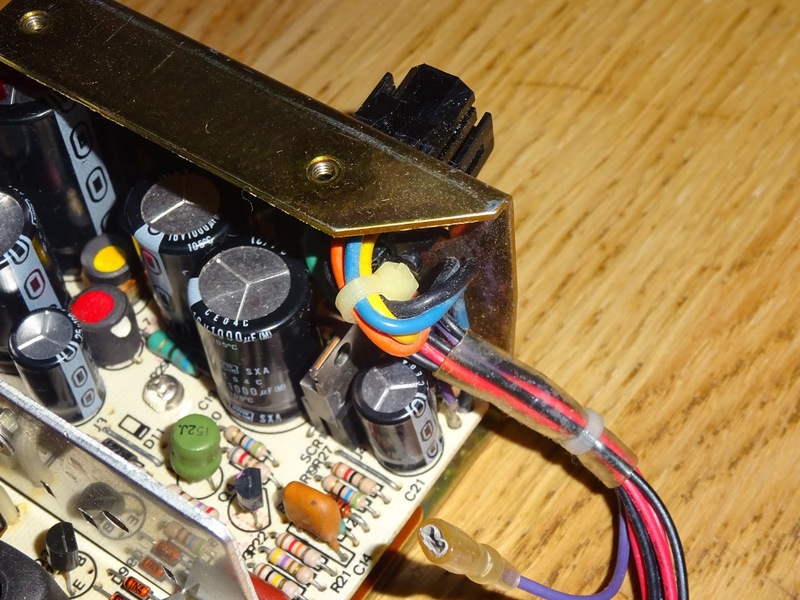 The board fitted nicely onto the plate inside the modulator case, stuck on with some double sided tape. 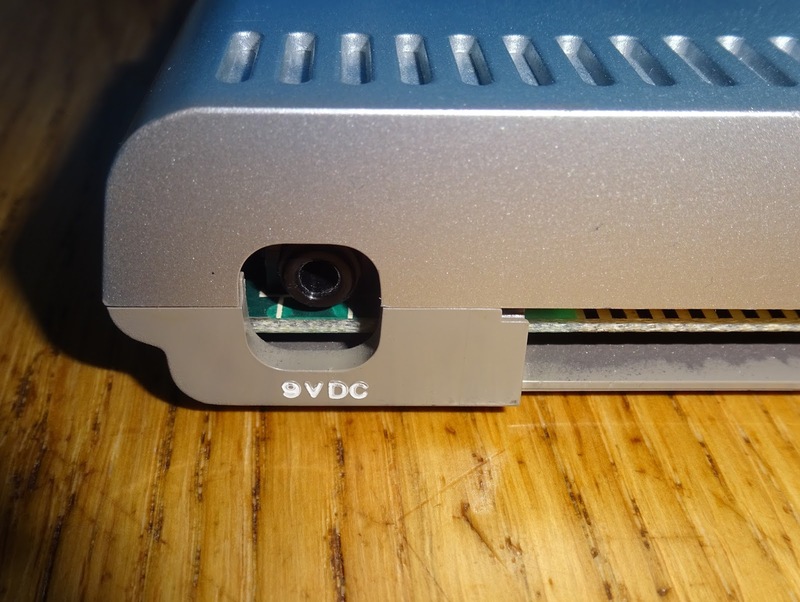 The top two ground connectors give a bit of extra support and hang over the side of the case, held down by the lid. 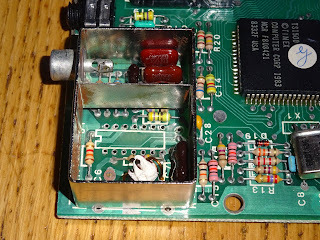 The two green wires on the right connect the 5V and video signal into the board. 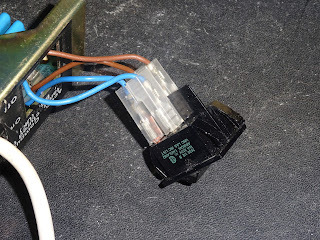 The green wire on the left threads under the plate and connects to the output phono connector (the original wire having been disconnected). With the lid back on the modulator, you wouldn't know it had been modified. 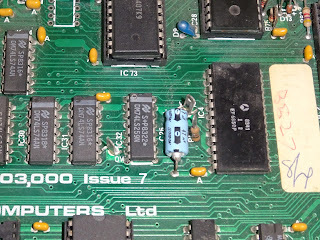 Powering on, it looks like we have a picture. 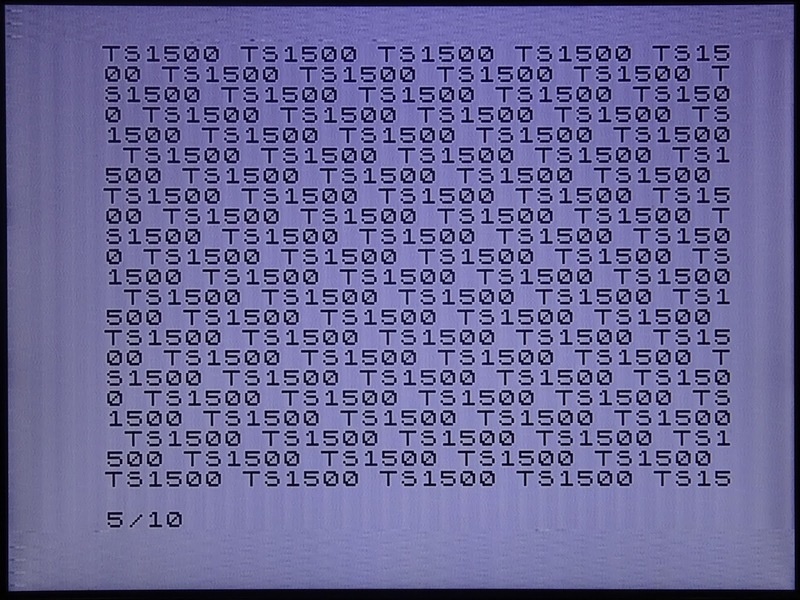 The TS1500 is by default in 60Hz NTSC mode. It should be possible to switch to 50Hz PAL mode by grounding a pin on the ULA, but for the moment NTSC is fine. 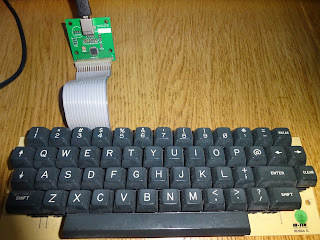 To test it, I connected a spare keyboard. 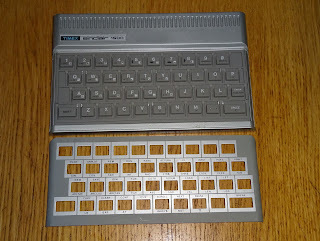 I couldn't use a ZX81 keyboard for two reasons, one the connectors are spaced apart like a Spectrum, and secondly it appears they are arranged like a Spectrum, with the columns reversed and the rows rearranged. 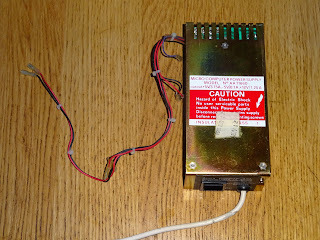 Since it appears to be wired like a Spectrum I used a spare Spectrum+ lid. 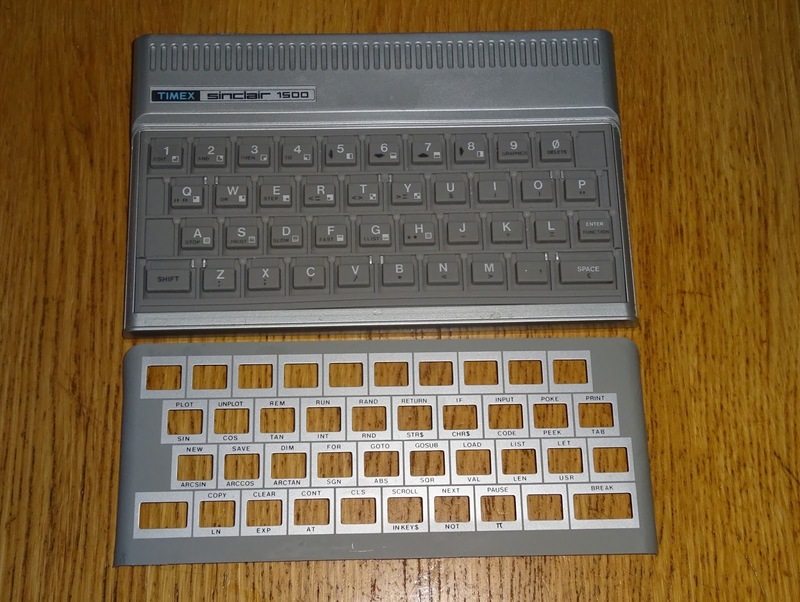 It just felt wrong using the Spectrum keyboard to type into what was effectively a ZX81, but most of the keys are the same, so even the extended 'press two keys at once' Spectrum+ keys worked. 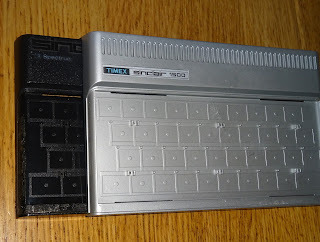 Only things like the " key which presses the symbol shift and P keys is no good, as on the ZX81 (and TS1500) it needs shift+ P, however things like the arrow and delete keys work correctly. 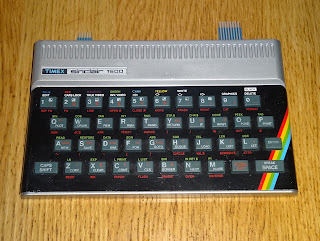 Looks like we have a functional machine, so it is wired like a Spectrum, and it wasn't much of a surprise when I confirmed it was pretty much a Spectrum. The metal faceplate was attached with double sided tape, so just a case of carefully prying off the cover without bending it. 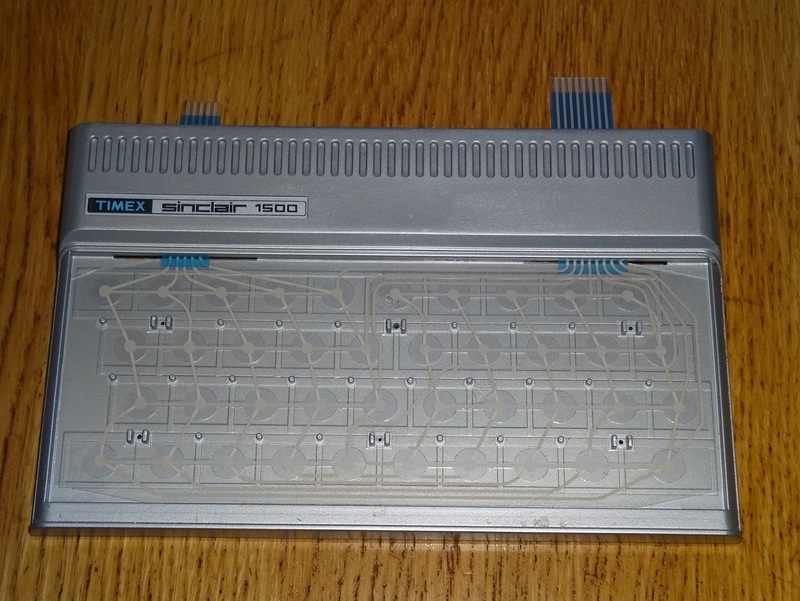 Under that was a familiar looking keyboard membrane. Comparing this to an early ZX Spectrum membrane, they appear identical, and indeed both have suffered the same fate. 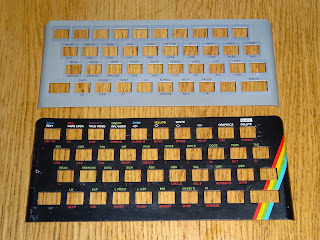 The metal faceplate is also interchangeable with it's Spectrum counterpart. 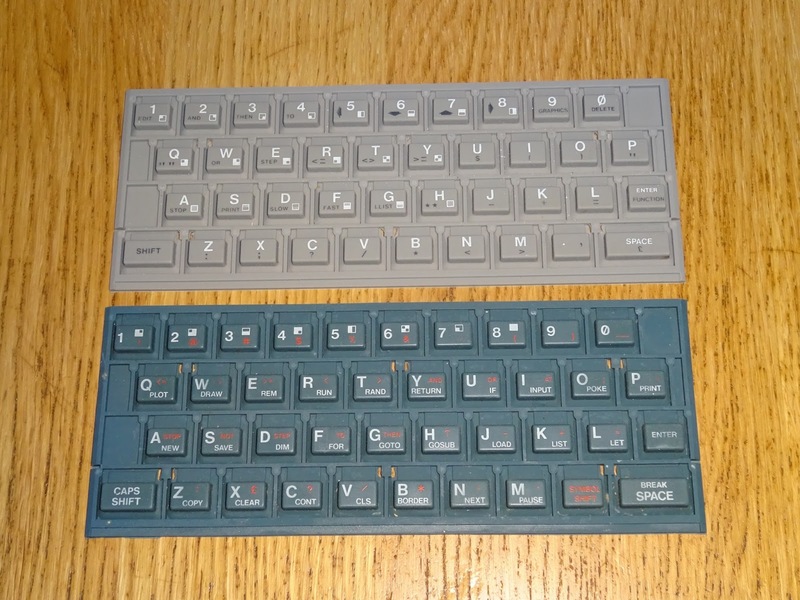 As is the keymat, but obviously the symbols on the mats and faceplate are different. 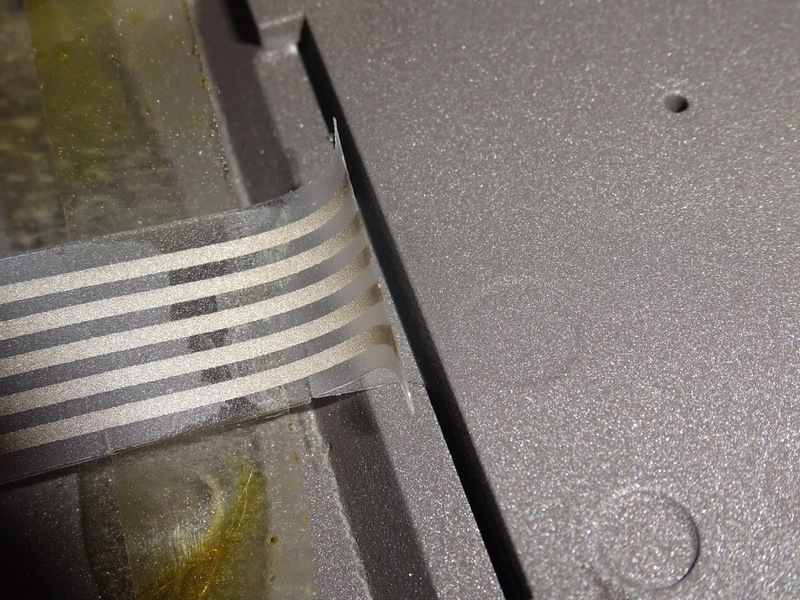 So do not do this, I was just testing the membrane before sticking down the cover. 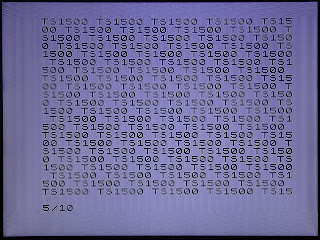 This is probably what the TS2000 / TS2048 would have looked like, but it was dropped in favour of the TS2068. Finally, the cases are also it would seem very similar. Given all this, it seems reasonable to assume a ZX Spectrum replacement membrane should be suitable. This one of from RWAP. That fits in place perfectly. 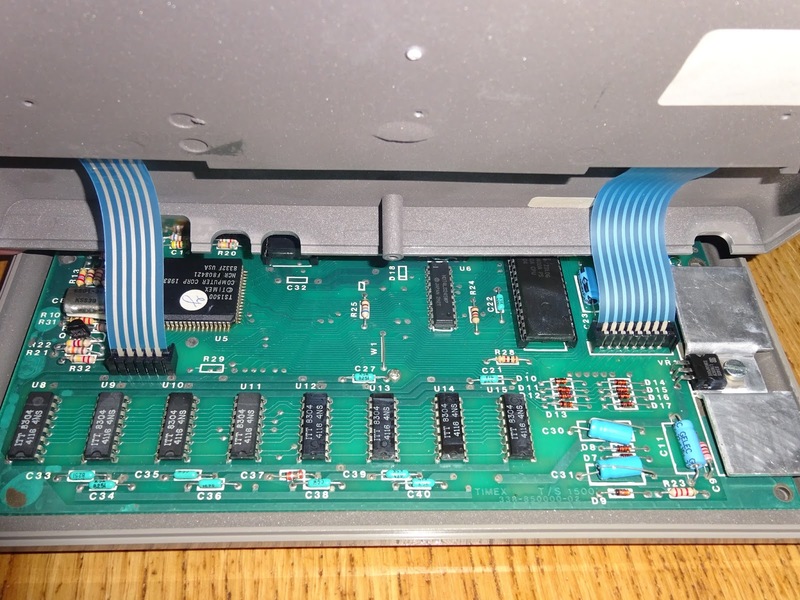 The keymap and faceplate fit back on, and it's time to plug into the board. No problems there, the tails were the standard length, and don't seem to fowl anything. 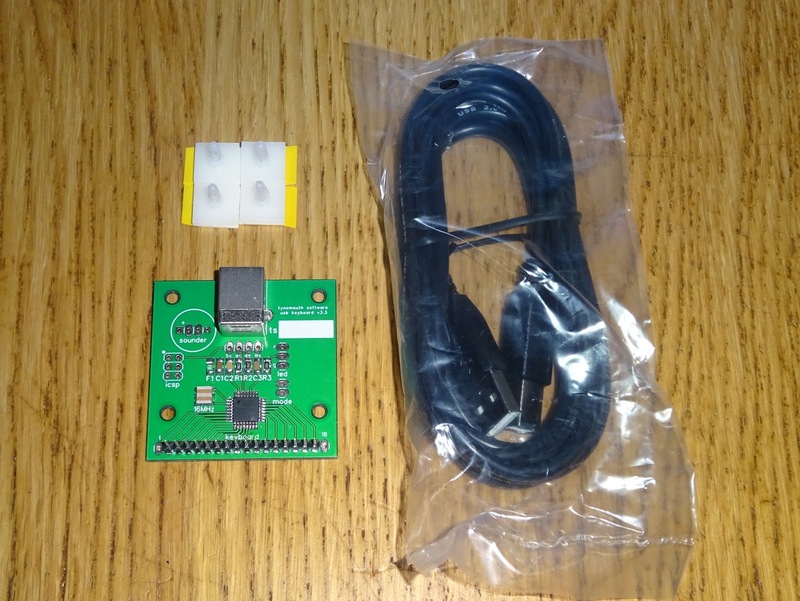 Time to test it out. 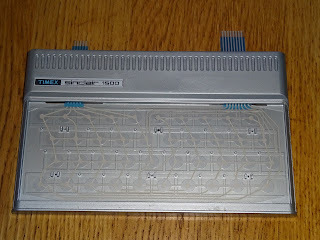 All keys working, so in answer to the question, 'can you use a ZX Spectrum replacement membrane to repair a TS1500? ', yes, you can. 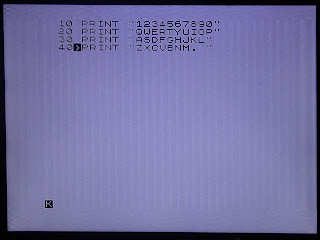 I am assuming it is software compatible with the ZX81, but so far I have not been able to load anything from tape. 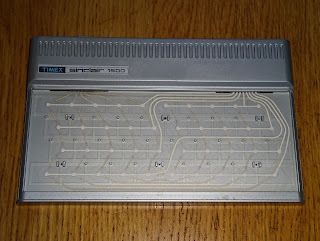 The TS1500 does look to have a transistor buffer on the input, so I may need to fiddle more with the levels. I have not produced a Dragon 32 USB keyboard kit until now, as no one had asked for one. Someone has now asked for one, so here it is. The Dragon comes in a massive case, so there will be no shortage of room inside. The keyboard is a simple 7x8 matrix connected to the mainboard with a 16 way 0.1" header. 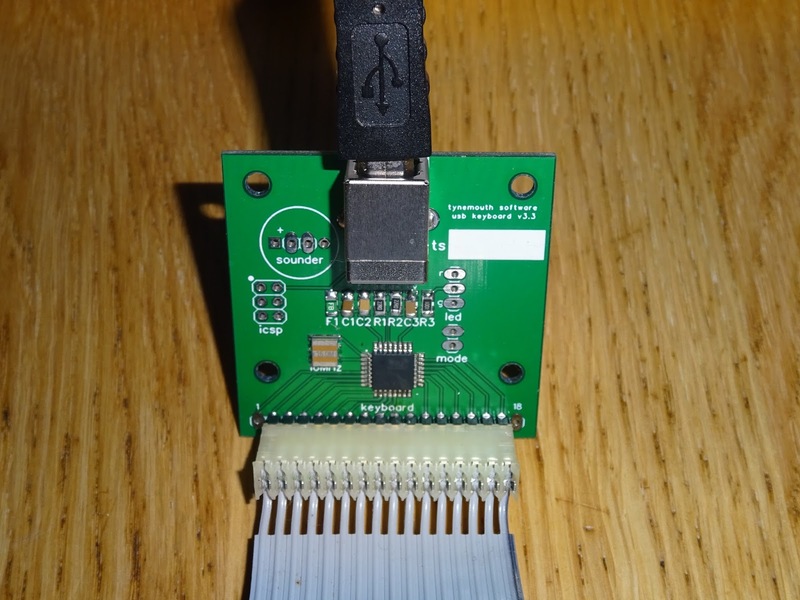 So just a case of unplugging that and plugging into one of my USB keyboard controllers. 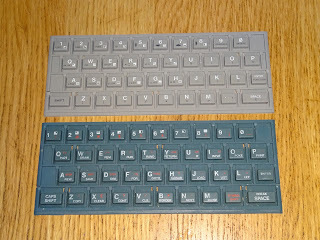 The keyboard mapping is fairly straightforward, although the keyboard matrix is wired alphabetically rather than in straight rows and columns. 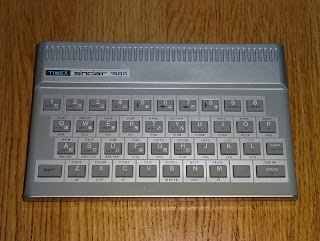 There are limited keys on the keyboard, so I have gone for a fairly straight key mapping, with 'BREAK' mapped as 'Escape' and 'CLEAR' mapped is backspace. 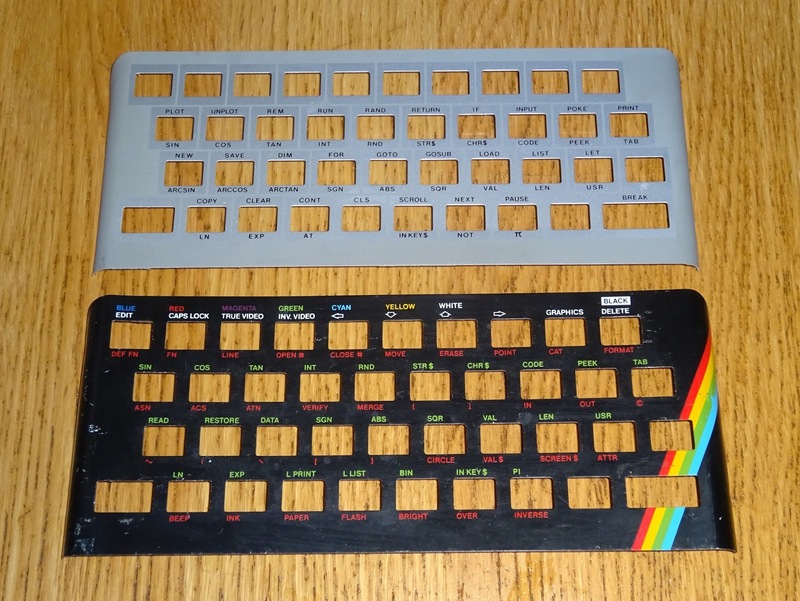 Other than that it is my usual plan of making the keys match what is printed on them (i.e. 6 has & above it, so when you press shift + 6, I actually send shift + 7 so that an ampersand appears). 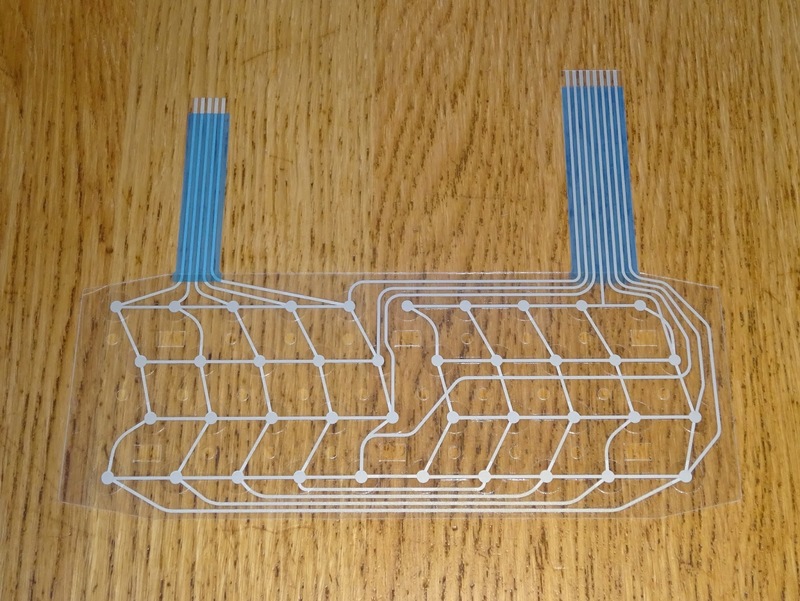 A more complicated mapping could be added if required. Not much more to say. 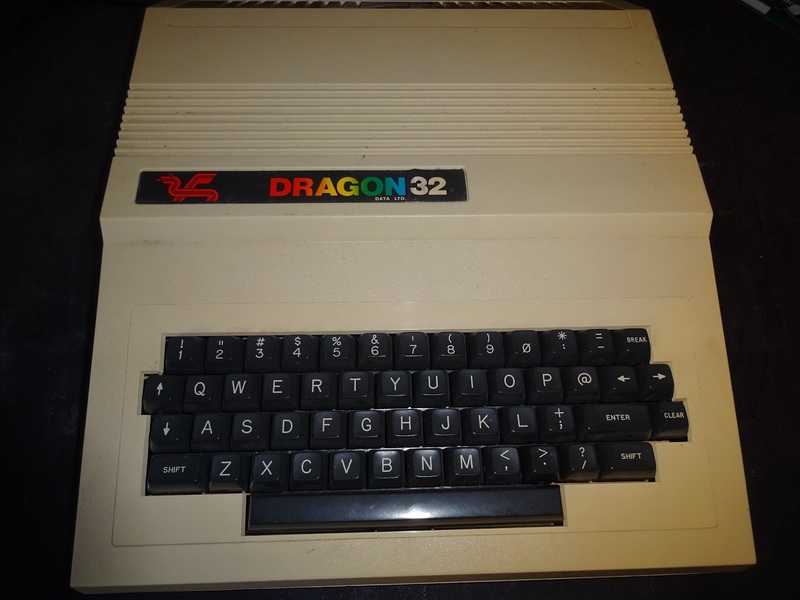 Dragon 32 USB keyboard kit. 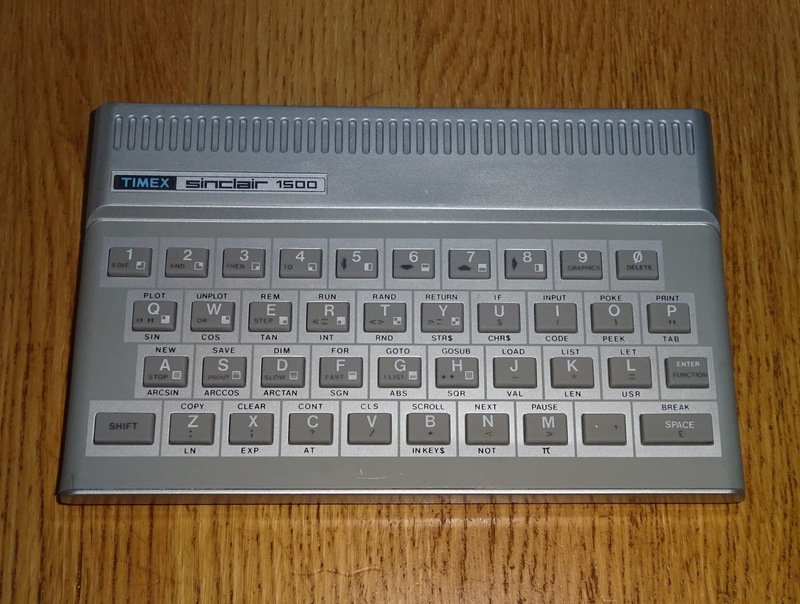 It should work on a Dragon 64 and TRS80 'CoCo' model 1, but I haven't tested those. 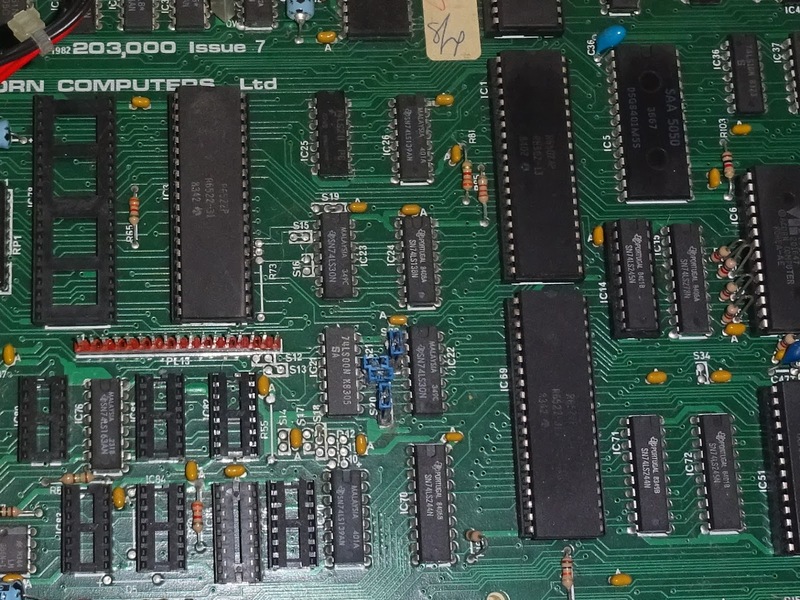 Here we have quite a nice looking Issue 7 BBC Micro. It's nowhere near as yellow as it looks in this photo. 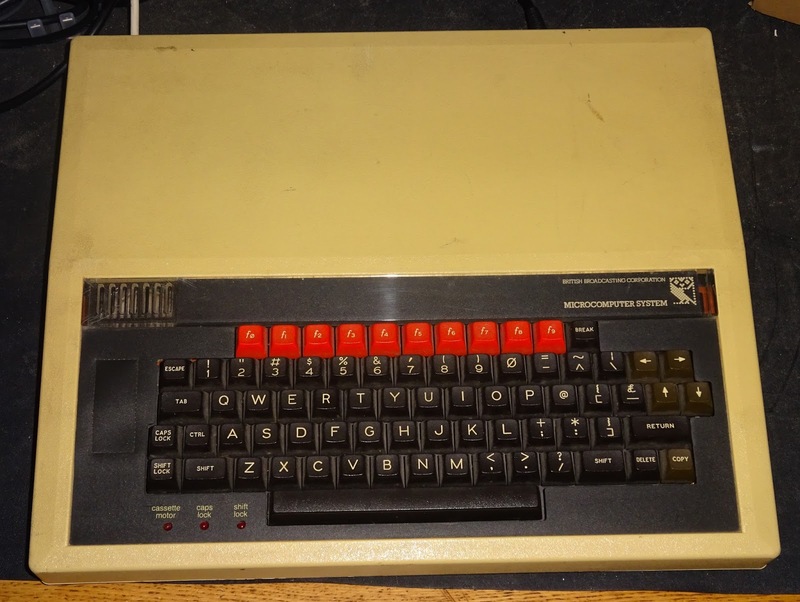 BBCs are a bit like Commodore PETs, they often contain all manner of upgrade boards and add ons. 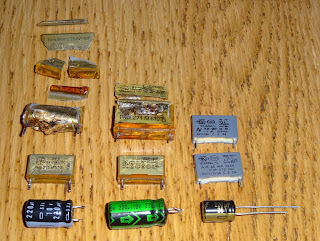 You never know what you are going to find until you open one up. 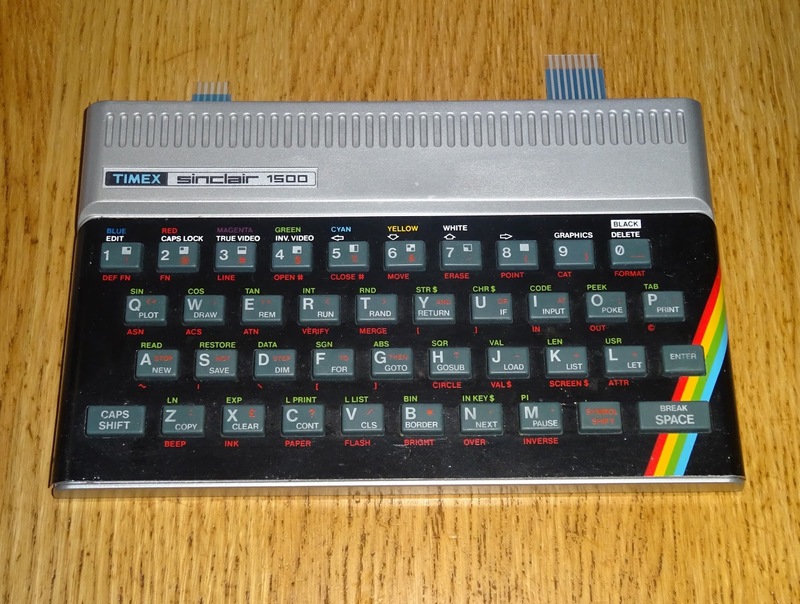 This is one of the more boring ones, but still a nice machine. 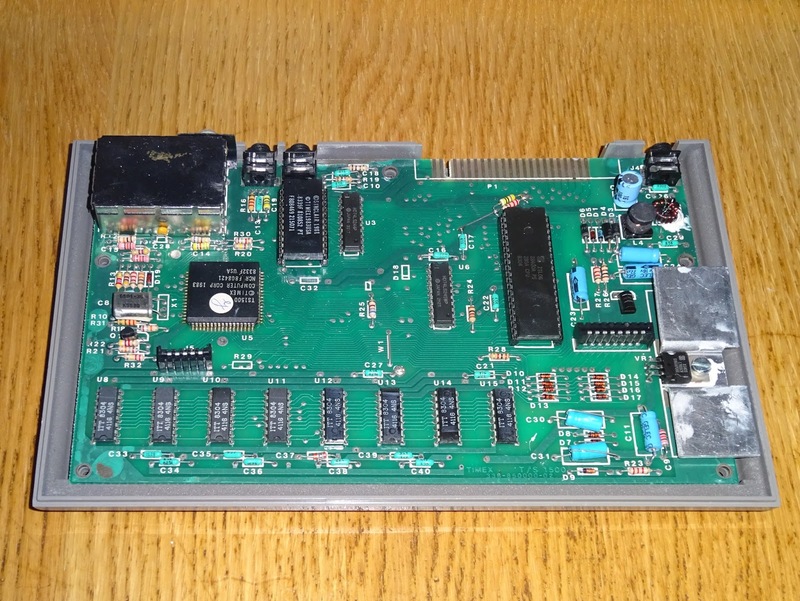 A tape only issue 7 model B with no expansion ROMs, disk controller, speech synth, ECONET or any other goodies. 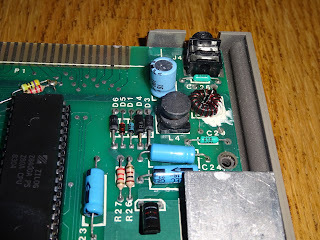 Before I go any further, I've replaced the power supply mains filter capacitors, and finally got around to writing a blog post on BBC Micro Power Supply Repair. With the power supply taken care of, time to turn it on and see what's wrong. 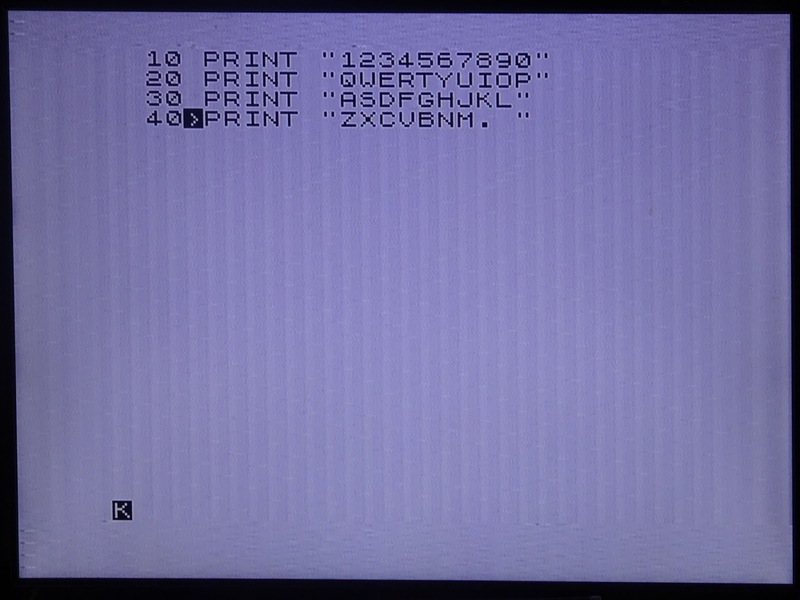 Not a bad start, a single beep, and a flashing cursor. 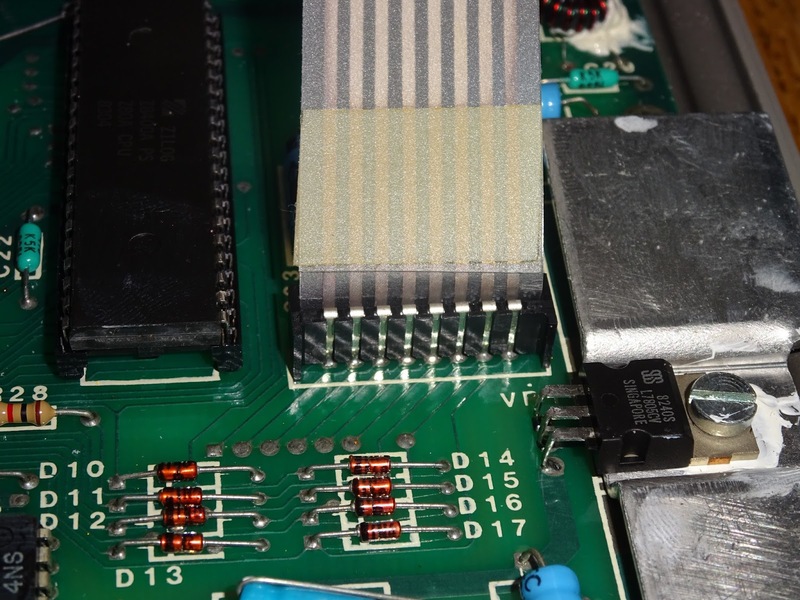 This is a common fault, and is normally caused by a faulty system VIA (the 6522 to the left of the CPU). 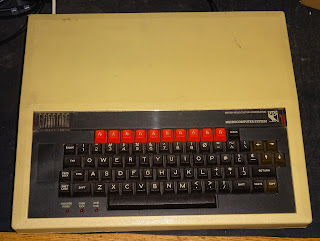 Handily, the user VIA (the 6522 below the CPU) can be borrowed to test this as it is only required for access to the user and printer ports, and the BBC will boot without it. 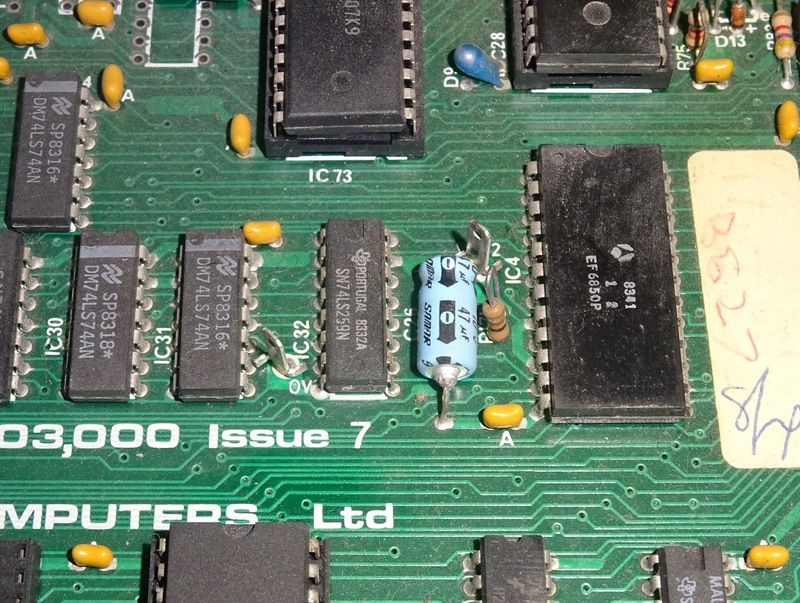 Swapping the VIA made a difference, so we can probably conclude the original was faulty. 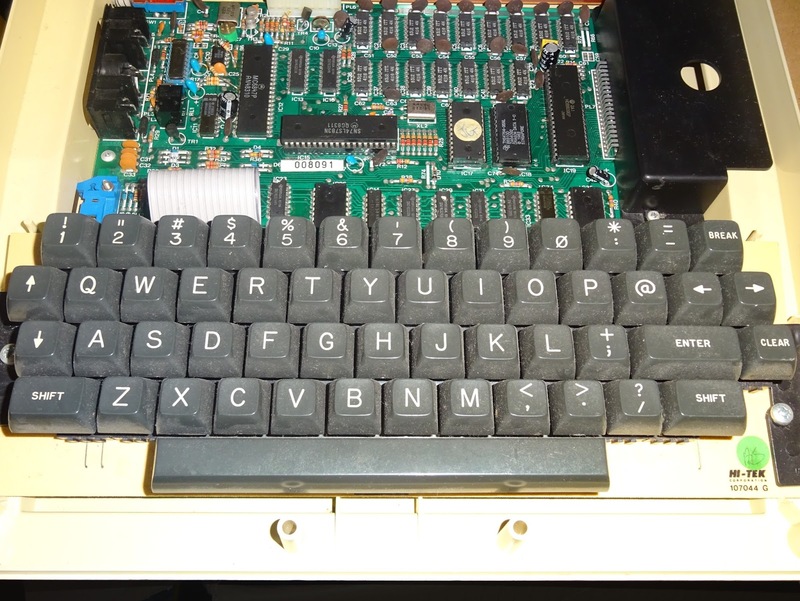 There is now a BASIC prompt, but the beep is now permanent, and the keyboard is not responding. 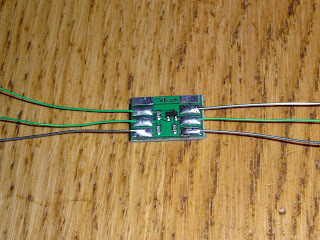 Fitting a known good 6522 gave the same results, so the orignal VIA was faulty, but there is something more. 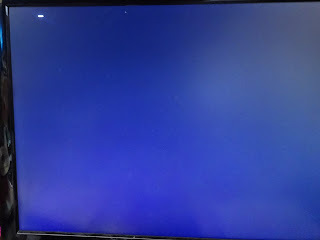 The VIA is necessary for boot because it controls a lot of the internal devices, and when it's not working, the boot sound isn't cleared and the keyboard won't respond and various other issues with screen mode etc. can occur. 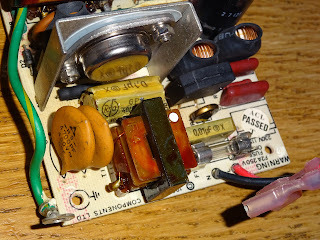 Tracing the control circuit out, the VIA drives a 74LS259 addressable latch. 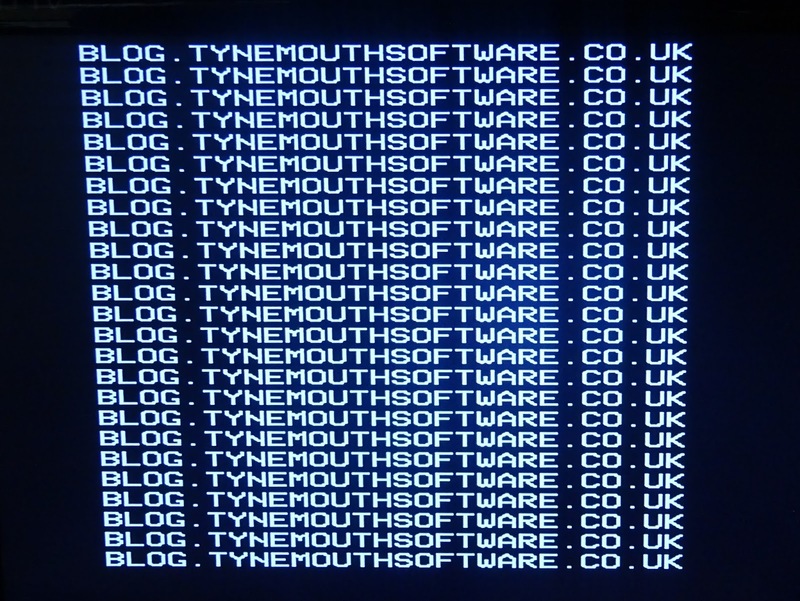 All the outputs of this were static, they should be moving around at boot, which was confirmed on a working beeb. 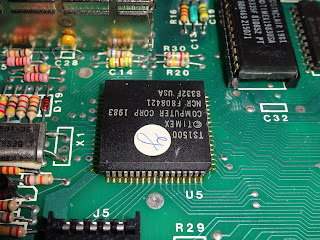 I removed and tested the chip, and it failed in the IC tester. 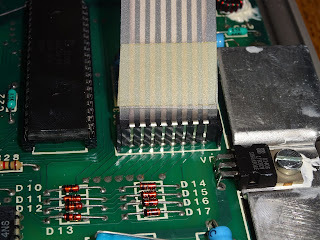 I didn't have any new LS259 to hand, but I found a used chip which was a better match to the surrounding chips than the original was. 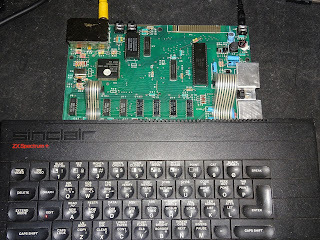 With that in place, I got the familiar double beep at startup, and the keyboard started responding. The usual tests looked good, I'll leave that to soak test for the moment whilst I decide which disk interface (or rather disk interface replacement) I am going to fit. If the wonderful BBC micro computer has an Achilles heel, its the power supply. 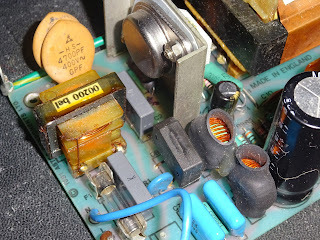 And the Achilles heel of the power supply is the Rifa brand mains filter capacitors. This is a rare photo of one which hasn't failed. Yet. These have a tendency to fail and go bang and create large clouds of noxious fumes. It's not pleasant when it happens. And it will happen. These are all failing. If it hasn't gone bang yet, it will do. 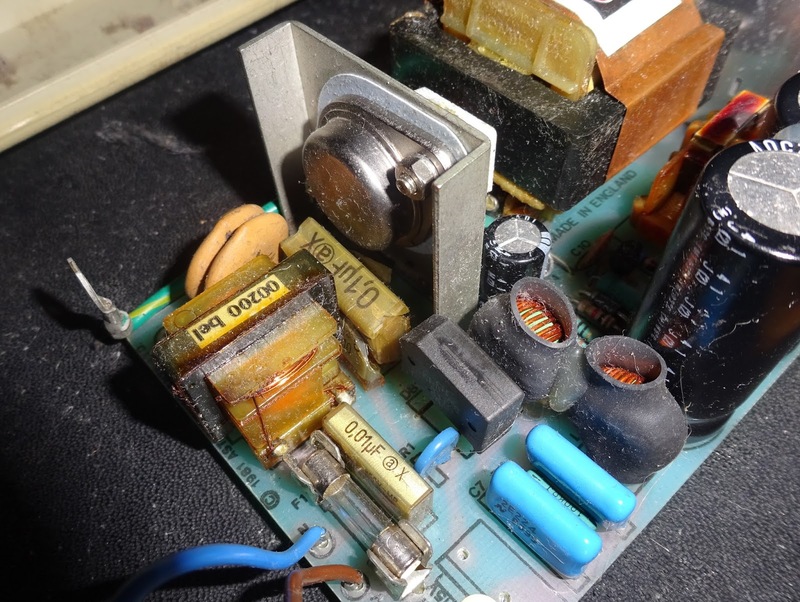 There are similar problems with mains filters on Commodore PETs and the same capacitors on the monitor in an ICL One Per Desk. 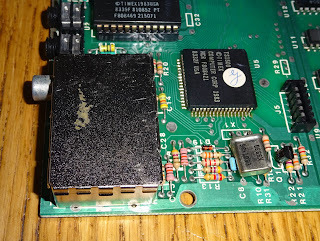 Here you can see the cracks in the side of the case where the magic smoke escaped from. This one has been removed from the case, you can see where it has bulged and shattered. 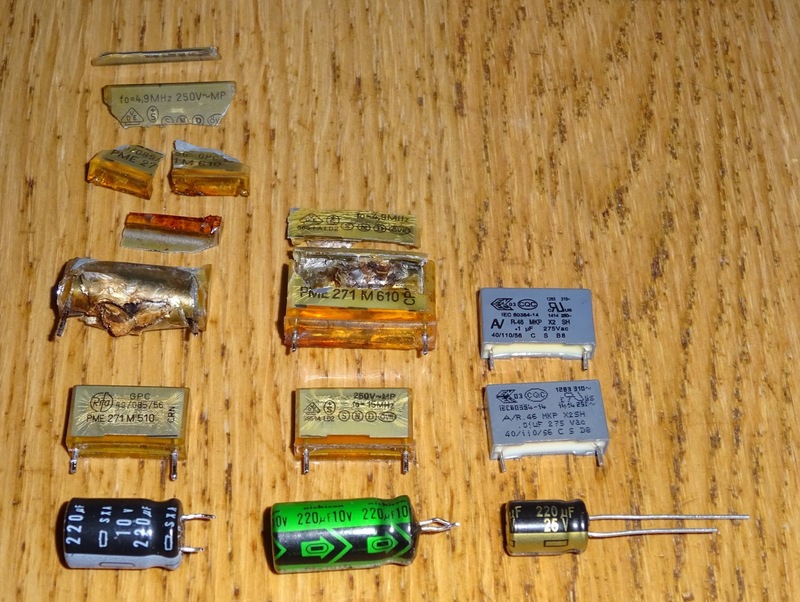 My standard practice whenever a BBC comes in is to replace these capacitors before I even switch it on. 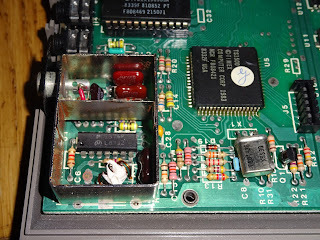 The one time I deviated with 'just a quick check before I do the power supply caps' resulted in one going bang as soon as power was applied, so now I stick to the rule. 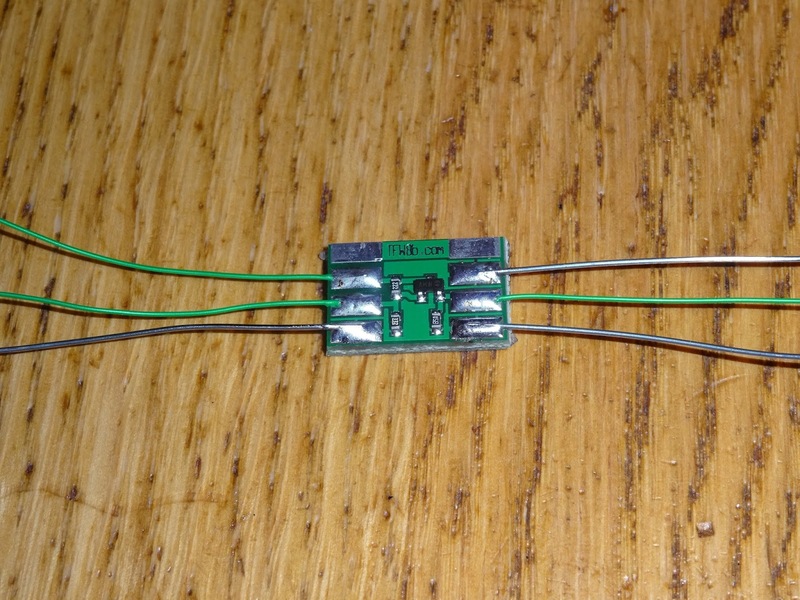 There are two X class capacitors filtering the mains input, a 0.01uF and a 0.1uF. X class capacitors are rated to be fitted across the mains supply (as opposed to Y class, which is rated to be fitted in series with the mains supply for capacitive droppers etc.). 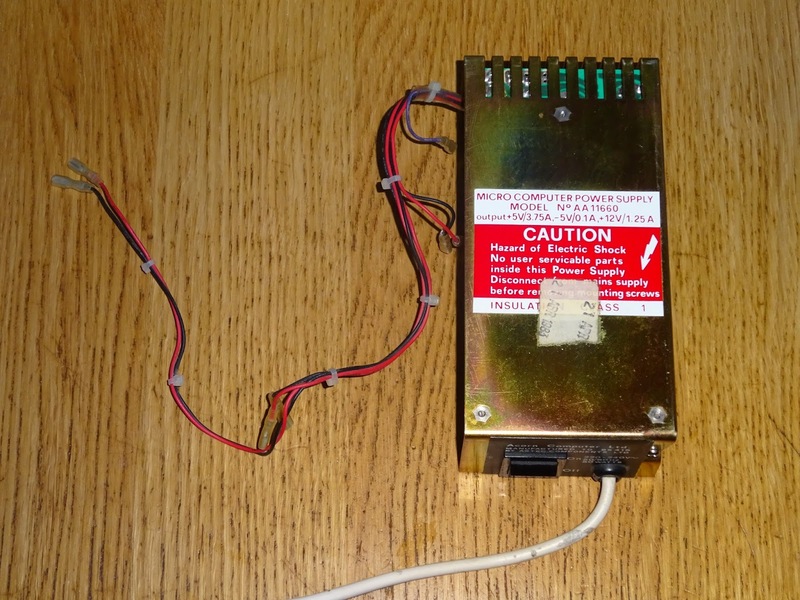 This means they have mains voltage across them, so when they fail, they really fail. The set on the left are from one that must have been quite loud, the centre set just a minor bang, and the ones on the left, the modern X2 class replacements. 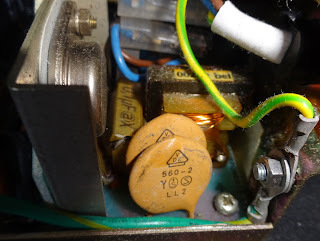 Also shown is an electrolytic capacitor which sometimes gives issues with slow or intermittent power supply startup. I normally replace those at the same time. You can see the gold band on the new electrolytic capacitor in the centre of the picture, and the grey boxes of the new X2 caps. 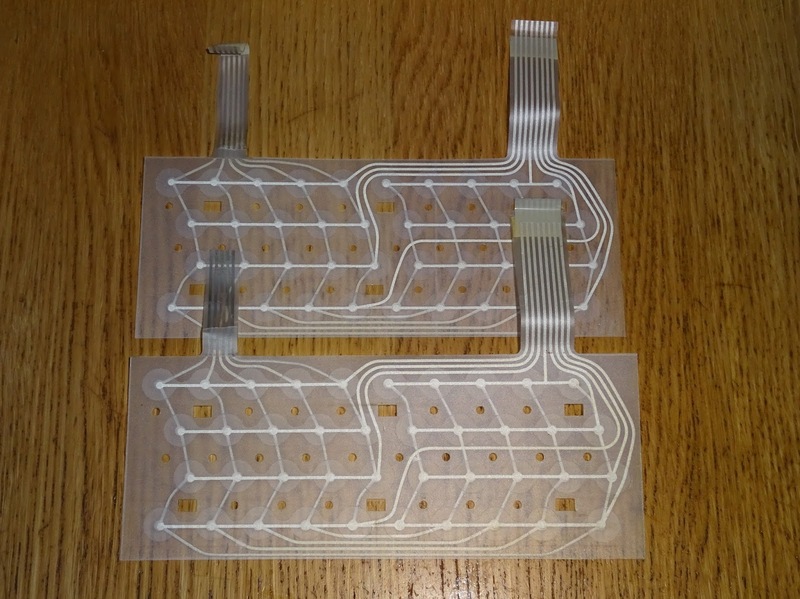 The modern 100nF cap is physically smaller, but there are sets of holes in the board for either size. 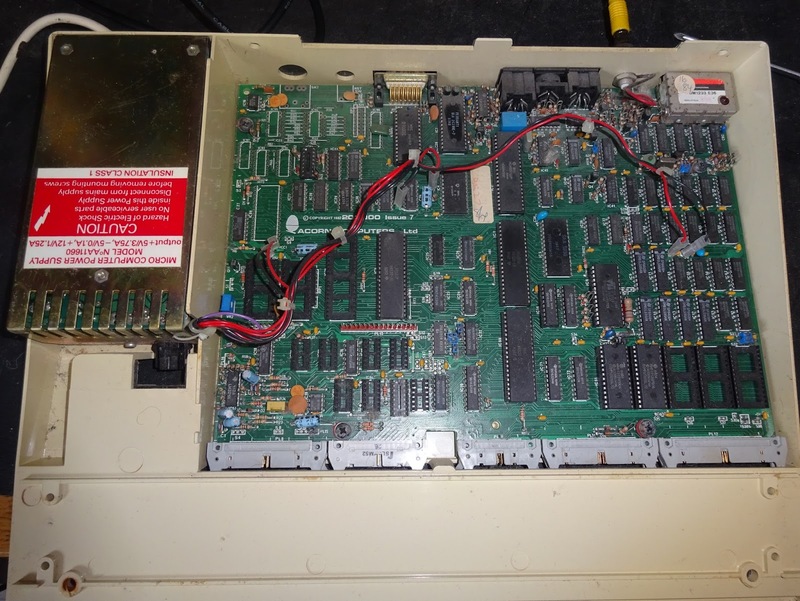 These power supplies are a little tricky to work on as you need to remove several earth bolts, push out the floppy drive power connector and mains switch in order to remove the board. A tip here is to push out the switch (by pushing flat the retaining tabs) before removing the spade connectors. All refitted, ready to begin testing the rest of the system.